The licensed Tweety Cage jump is an unusual and fantastic jumper featuring everyone’s favorite Looney Tunes birdie, Tweety Bird! The design of this jumper is that of Tweety’s actual cage, complete with a carrying handle on top and an oversized, three-dimensional Tweety perched above to watch over all of the fun. Scenes of Tweety and that rambunctious puddy tat, Sylvester are done in artwork around the inflatable bars of the cage. 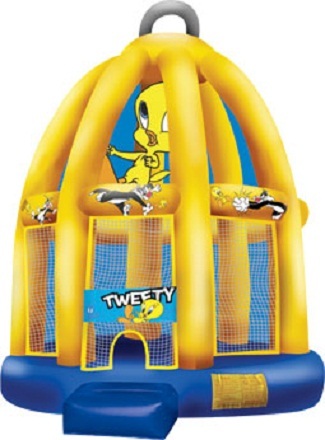 The Tweety Cage jumper provides more than 315 square feet of bouncing room, sure to lure in fans young and old, or anyone trying to escape a puddy tat. This unit does not have a roof so should not be rented during extreme Heat of the Summer Daytime. JumpMaxx has worked hard and long to provide to you the most unique and wondrous inflatable products to entertain your family and guests at any party, event, and fund raiser. JumpMaxx prides ourselves in providing America with newer, cleaner, high end entertainment with inflatables like the Tweety Cage and many others.